In 2010 and present 2011, like what I was saying previous posts, I have listened several Audiobooks. A while ago, I have posted “What Do Women Want From Men” that is an Audiobook explaining about the relationships between men and women. 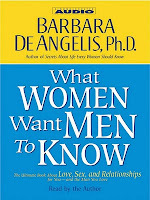 Now again, one more book, namely What Women Want Men To Know. It doesn't matter you are a guy or a girl, after listening this Audiobook, you will understand more deep inside of your man or your woman. If you are a guy, this is a book of explanations items by items what your woman want you to know and if you are a girl too, you can ask your man to listen this Audiobook, you could even use it as a negotiating tool for your better understanding relationships for happy and prosperous future. Here is a short description of the Audiobook. DeAngelis (Secrets About Men Every Woman Should Know) here writes for both men and women, aiming to help men understand the women in their lives and to help women understand themselves more clearly. She divides her book into three sections: what women want men to know about them, about love, intimacy, and communication, and about sexual turnoffs and turnons. The material comes from DeAngelis's 25 years of counseling, events in her own life and the lives of her friends, and a questionnaire she sent to hundreds of women. DeAngelis has a frank, to-the-point style, but she is neither profane nor voyeuristic. She hopes that a woman could hand this book to her companion and say "Read this and you will understand me" and it is just that sort of book. It delivers what it promises, is compelling reading, and is easy to grasp, with boxed hints and the use of both boldface and italics to help readers separate her ideas. Her concepts of the "dove pie" and "Love House" are worthy of the price of the book. Great talk-show material, this will be popular in public libraries. IF YOU’RE A MAN: Read this book to learn what you can do to be a woman’s dream come true. IF YOU’RE A WOMAN: Read this book to learn why you are the way you are, and give it to the man you love so you can have the relationship you’ve always wanted.